Discussion in 'Blog' started by walesy, Jan 28, 2016. Bam! 6 and a half more hours. Then another kajillion hours of tweaking. Then it's the off season again. Ah, the circle of Supercoach, how I love thee. So who were your first picked players? Lock in Liberatore, GAJ, Leuenberger, Crouch, Petracca for me. Definitely got Libba in there. Mitch Brown also locked. Ended up with this after first cut. In past years newspapers such as the Geelong Advertiser have offered $1k plus to the best placed entrant who has joined through their website (rather than the Herald Sun) - not sure if this is still the case but it's worth doing if you have read this before entering. Will post mine in the morn. Am on the phone now. Also, is there an $18000 prize to the league who wins round one? Tasty. Had to enter fast to get a low Id. Where am I going to find that? I saw it in the html of the league page. do we have a group yet boss? Horrible interface, gotten worse over the years. Only able to have 8 players on the screen without scrolling is horrible planning. Those numbers below logo create a lot of useless white space. Graphical layout nightmare imo. Makes you more dependent on spreadsheets. I didnt mind the layout in general, but like you had plenty of grumbles about the RHS, not only do you see so few in a view but the scroll is incredibly slow and the filters hard to select in that they drop below the screen..
Yeah filters is annoying and having to scroll twice (on screen and in their own selection box) is really bad website planning. Cant believe it got through planning stage. God, the scroll! You spin the mousewheel like a madman, only to find you're 3 players through! Definitely needs a tweet that one. Also, took forever to spot how to join a new league- but it's cool once you know where it is. 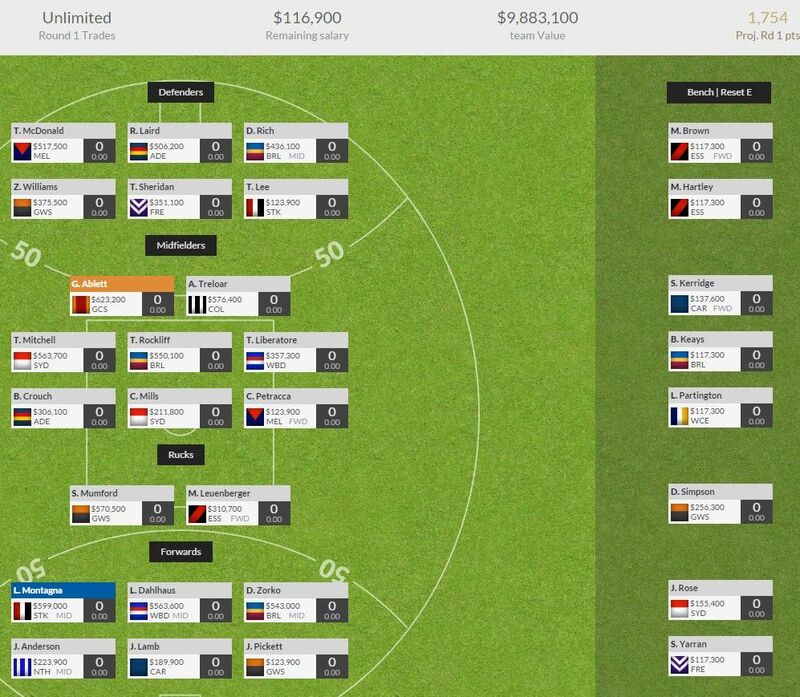 I'm also rocking a bit of the mid-price madness thus far, but with $300k in the bank, can see Suckers and Martin getting upgraded in the forward line pretty quickly. Out: Laird, Suckling, J. Martin, Daisy. Feels like 4 improvements that one.